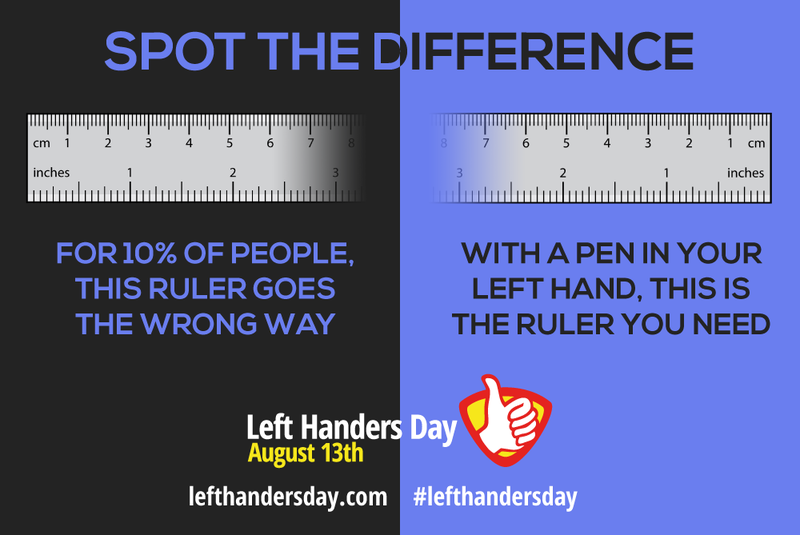 Left handers day is coming up on Aug 13. I am right handed, but my mother, husband, mother-in-law, and two of my children are left handed. I am left handed so you know I just loved seeing this! Thanks for sharing. While I am not left handed our oldest DD is, and we are very proud of her. Great post! Happy WW to you! My youngest daughter is left handed. I never thought about the ruler going the wrong way. Interesting. That first graphic really puts things into perspective. Never once thought about that before. I'm left handed and blogging about left handers day next week. Boy when your right handed we take left-handers for granted that they can manage, but Im sure there are times when they struggle in a right-handed world. Very cool. I am actually left-handed but I was taught in pre-school how to do things right-handed. At the time when I started school (back in the mid-70's) you had to adapt as there was nothing for left-handers and the teachers thought you were inferior to the rest. So, I learned to do things right-handed. I'm not left-handed, but like my father before me, I think we were made to be right handed. It used to happen more than nowadays. I have a few family members that are left handed. My dad is one of them. I grew up with him having a lefty pencil sharpener, and the computer mouse on the left side. I got used to it. He must have been right. Funny - I'm left handed but I never would have thought of a ruler as going a right way or a wrong way. I guess it could be that you'd cover it up with your hand less the other way maybe.